Medellín is often associated with violence and Pablo Escobar, but I want to assure you, Medellín is a thriving city – promoting literacy, art, and social equality. Back in the early 1990’s Medellín was listed as the most dangerous city in the world. Drugs, crime and violence ruled. Since then, the city has undergone a transformation. After Pablo Escobar was killed, residents and officials vowed to clean up Medellín. They started building many new public buildings, libraries, parks and an amazing public transportation system. This has turned a once crime ridden, run down city into a thriving metropolis. Safety has become a huge concern of the government of Medellín and it shows. Medellín has gotten itself off the “Most Dangerous City List” and has turned itself into a tourism destination. Steve and I spent 6 days here, and would love to come back. Medellín underwent a huge social equality undertaking in 2004 when the mayor pushed his “Commitment of all Citizens” plan to action, with a main goal of creating equality for all citizens. Infrastructure arose, metro cables (air trams), metro light rail, and busses serving all areas of Medellín. In some areas with large hills, a large escalator type structure was built (the size of 28 floors), to encourage people to travel out of their neighborhoods. Medellín was one of 200 cities to win Most Innovative City of the Year in 2012, mostly due to their advancement in transportation. A tool we used often was an app called “Medellín Guide”. It was created by a blog we have been following, Medellín Living. 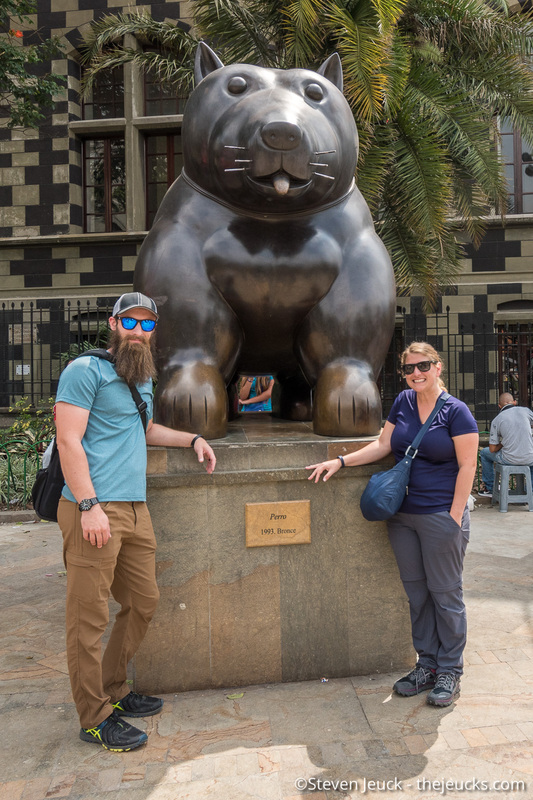 This blog is from an American (from Virginia) who traveled the world and ended up settling in Medellín. Now, with a team of writers, the blog review restaurants, museums, parks, events and more. It also provided such useful tips to get around. Throughout our travels we have relied heavily on the advice of others, but none has been used as much as we have relied on “Medellín Guide”. If you are traveling here, we highly recommend you download it. It was easy to fall in love with Medellín. Something I noticed quickly, this is a dog loving city. Everywhere we went, dogs were with their owners, often not on a leash. If their owner was in a store, their dog patiently waited outside. The food, the friendly faces, the dogs, the mountains and culture – all add to the allure of the city. On recommendation, we stayed at a hotel in the El Poblado area. It is highly a tourist area, with lots of bars & restaurants. It is also known for their nightlife as well as a place to learn Salsa. We enjoyed staying there. We traveled the city with a mix of Uber and Light rail. Uber here is similar to the US, and even offer options to have an English speaking driver. We didn’t take any busses or the air tram, regrettably, but did make use of the Light Rail system. For each ride, it costs us $2,150 COP (about $0.75 USD) each. Just like any large metropolitan area, it is recommended you keep your bag in front of you and be aware of your surroundings. Steve and I didn’t mind taking public transportation at all, it felt like we were back in NYC or on Bart. Throughout the ride, if people saw me looking at the map they would ask where we were going and tell us how many stops we had left (in Spanish of course, English is fairly limited here but people are always trying to help). Overall, people moved with a purpose but were pleasant enough. Medellín is a large city and offers food with both local and international fare. You can find Sushi, Peruvian, American, Italian and more. Steve and I tried to be a bit adventurous, trying local favorites, as well as their take on some of our favorites. Cazuela de frijoles – This is a traditional Colombian dish that Steve enjoyed. It is a casserole dish with beans, ground beef, fried plantain, fried pork skin, sweet corn and a huge avocado slice. Ajiaco – I enjoyed a traditional Colombian soup. It had a big cob of corn, the corn kernels were HUGE. The soup has chicken, and white cream – making it a creamy and delicious. I too also enjoyed the biggest avocado slice I have ever seen. Pizza – We decided to go to a local artisan pizza shop… You know Steve can’t go that long without Pizza. The pizza offered here was a lot more adventurous we have seen in terms of toppings: eggs, hot peppers, various cheeses, and more. Crepes & Waffles – We had to try this South American chain restaurant, which serves…. Crepes and Waffles. They take a French dish, with some Latin flare, and it makes for one winning combo. I had a peppers, cheese, avocado and onion in mine – so good. The dessert menu is bigger than their main menu. Also, they only hire women who are single mothers/helping their family to work. Overall great place, and hope to eat there in other South American countries. 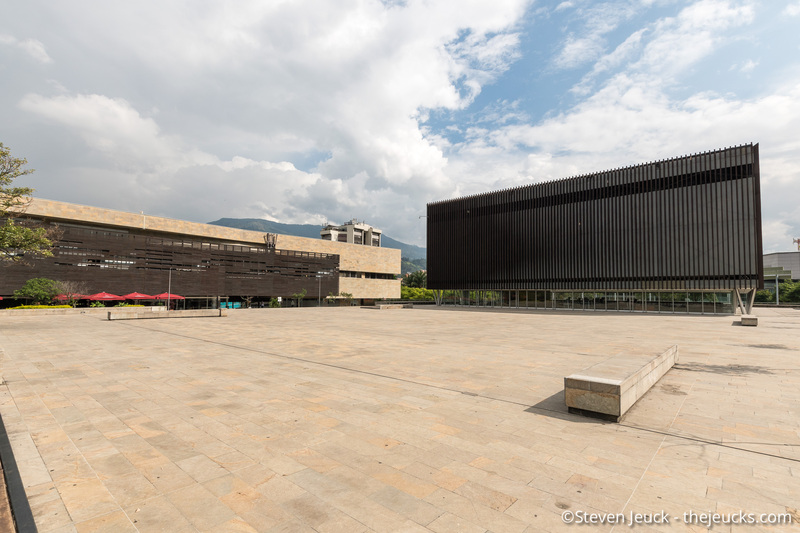 Museo de Arte Moderno de Medellín [Museum of Modern Art Medellín (MAMM)] – Medellín is becoming the art mecca of South America, and nothing was more evident of that than traveling to their Modern Art Museum. I believe by the end of our honeymoon, Steve will become a Modern Art lover. Although, not his favorite, we were both enthralled with a local famous artist, Débora Arango. Her paintings vary from home, life, family, to social injustice, violence and politics. During her life, her works often sparked controversy, but she continued painting without fear. MAMM underwent a multi-million dollar expansion in 2015, continuing Medellín’s aim to become an art capital. Steve and I spent two hours here. 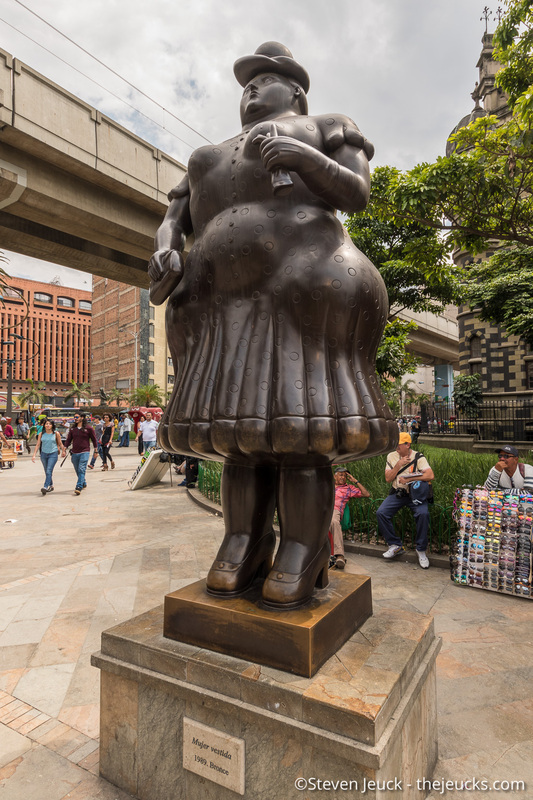 Plaza Botero – Fernando Botero’s work comes to life in this plaza, as 23 sculptures are on display. Fernando Botero is a Colombian artist (from Medellín) known for his “large” portions on paintings and sculptures. 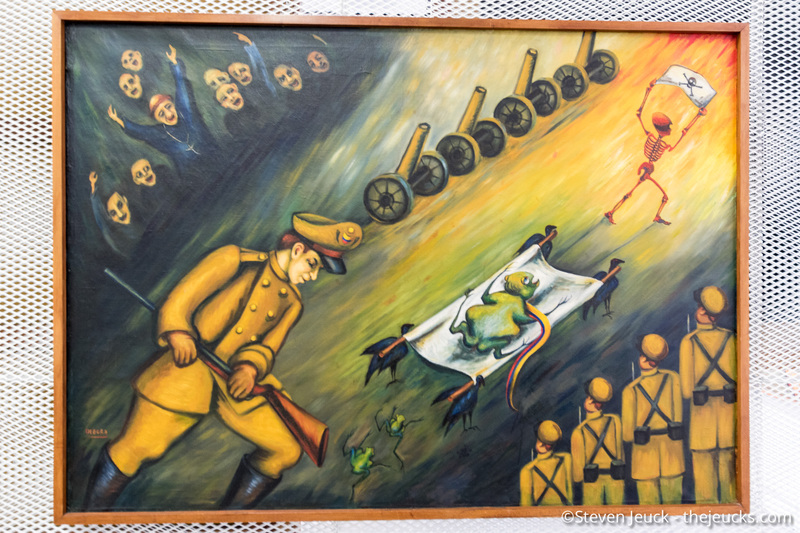 We later visited his paintings in Museo de Antioquia, in which there is an explanation that he is not obsessed with fat people, but instead, likes to paint in volume. What he makes is truly awesome. 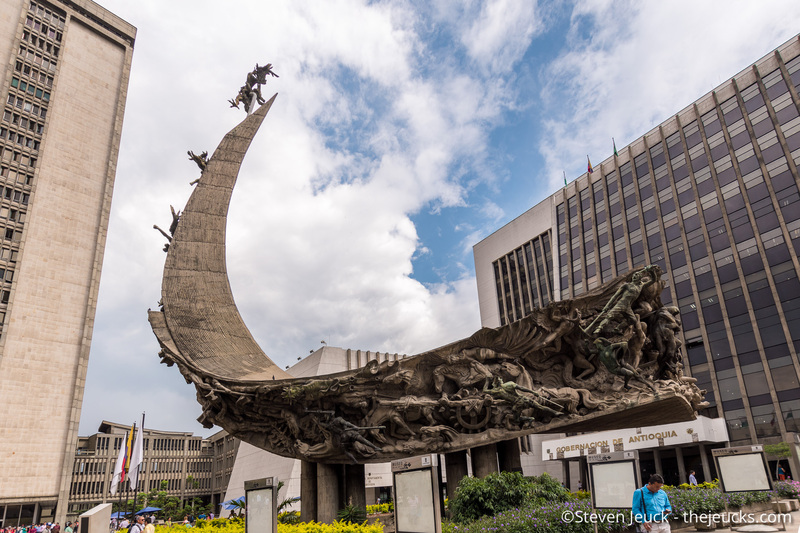 The plaza is located between Museo de Antioquia and Palace of Culture, so there is plenty to do in the area. Museo de Antioquia [Museum of Antioquia] – This is the department (state) of Antioquia’s first museum. Since its opening in 1955, the museum has gone through several renovations to today’s 17 rooms. All room are art, with a huge section dedicated to Fernando Botero. Steve and I spent an hour in this museum, with the majority of the time dedicated to seeing Botero’s work. The museum also has international works, and works from other well-known Colombians, such as Pedro Nel Gómez. For art lovers – this is a must stop. Pueblito Paisa y Cerro Nutibara [Little Town & Nutibara Hill] – Nutibara hill is one of the seven “guardian” hills in the city of Medellín. 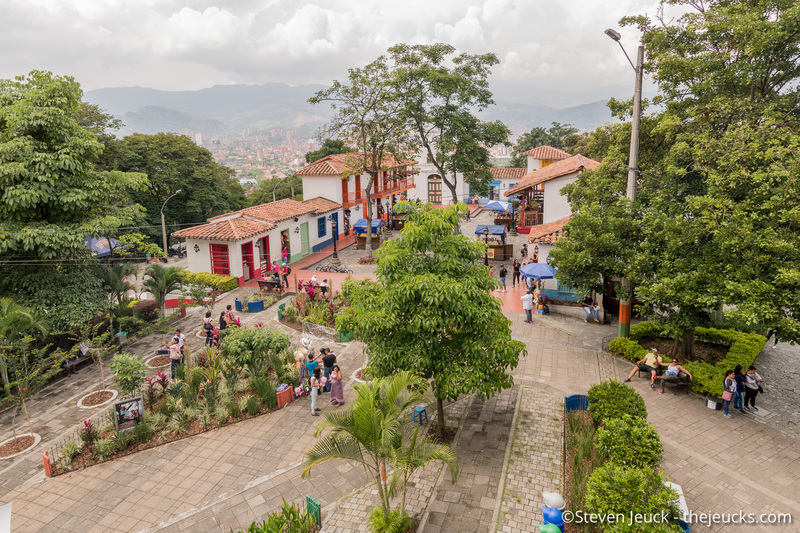 On the top of the hill, you will find Pueblito Paisa, which is a mock village from Antioquia. 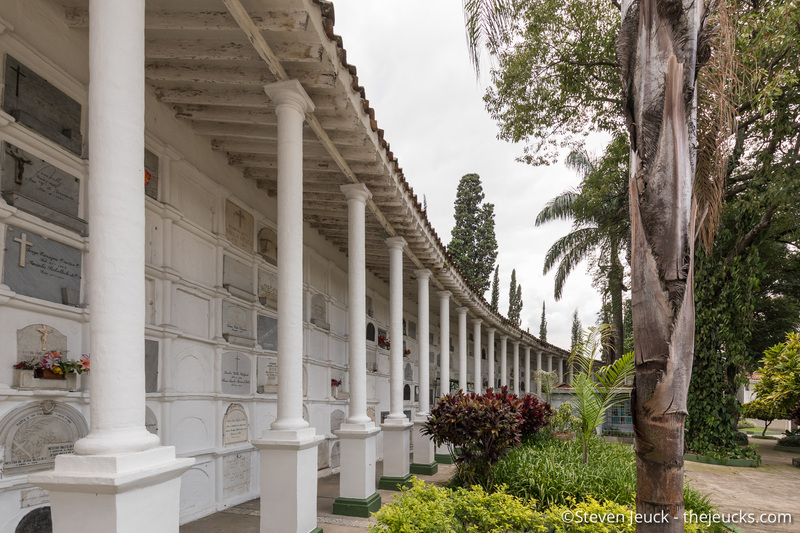 It allowed you to explore what life was like before modern Medellín. There is lots of restaurants and shops for tourists to partake in. Medellín City Museum – Located on Cerro Nutibara, you will find the Medellín City Museum. We are happy we hit this museum at the beginning of our trip, because it gave us great insight into the history of the city, as well as the current trends, transportation and attractions. The museum costs $2,000 COP (about $0.64 USD) each, and is pretty small, but something interesting to do at the top of the hill. Joaquin Antonio Uribe Jardín Botánico [Botanical Gardens] – The botanical gardens was just a short walk from the metro, and was worth the stop. There is plenty to do while here, including lots of dining, picnicking, museum, library and shopping. You can spend hours strolling around and enjoying the beauty. 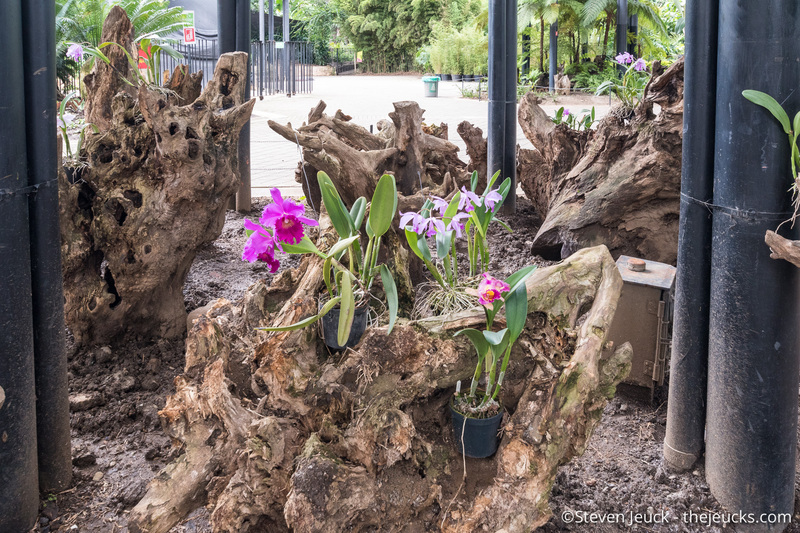 One of the most impressive features is the “Orchidiarium”. For our visit, many of the flowers were not in bloom, but we nonetheless enjoyed the varied plants and trees. During our time there, a downpour occurred and we sought shelter outside of the park. We meant to go back in the park, but ended up running out of time. Parque Explora – Next to the botanical gardens is Parque Explora. We weren’t surprised to read later that it was modeled after San Francisco’s Exploratorium. There is an aquarium, planetarium, vivarium, and tons of interactive exhibits to explore. We enjoyed it all! For a Saturday, it wasn’t too busy, and allowed us to have ample time to “play”. It was interesting to be in this kind of setting, everything was in Spanish, but the exhibits were simple enough for me to understand and participate. The employees there I believe our local college students, and most of them were excited to try their English to explain displays. The aquarium is the largest in South America. I have been spoiled with aquariums, living so close to Monterey, I have gone there most summers for the last 20 years. The aquarium at Parque Explora is much smaller than Monterey, but provides a unique look at fish from South America. They have a huge piranha tank that was fun to watch. 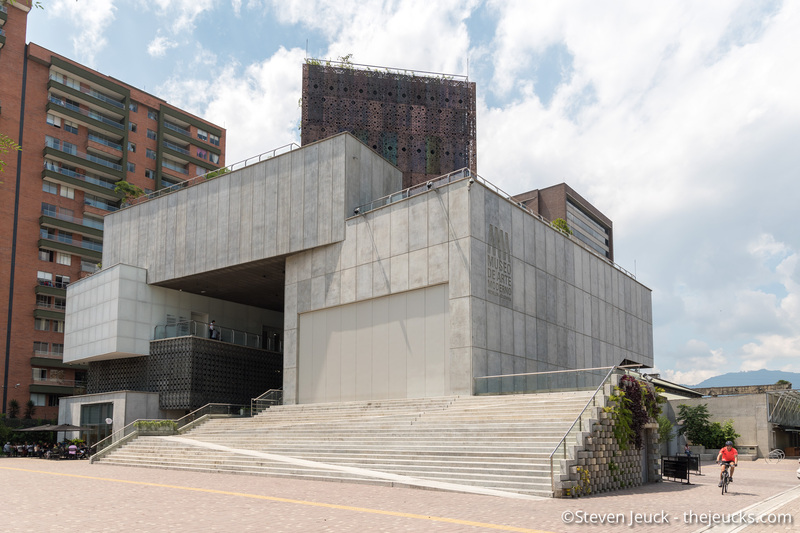 Parque Explora was $23,000 COP ($7.36 USD) each, and offers discounted prices for students as well as residents of lower income areas (who show their utility bill) – which shows more of how Medellín is trying to promote education and social equality. I would highly recommend going there if you are ever in Medellín, and plan for at least 3 hours. Cemeterio Museo de San Pedro [San Pedro Cemetery Museum] – Of course I had to visit a cemetery while here, and San Pedro came highly recommended by local bloggers. While we were there, a funeral was taking place. Steve and I didn’t get to explore the full cemetery for this reason, but what we did see was simply beautiful. Many events are held here, including concerts, literary events and art shows. I loved seeing such beautiful mausoleums. Parque de los Pies Descalzos [Barefoot Park] – A park that encourages you to take your shoes off, explore, and play. 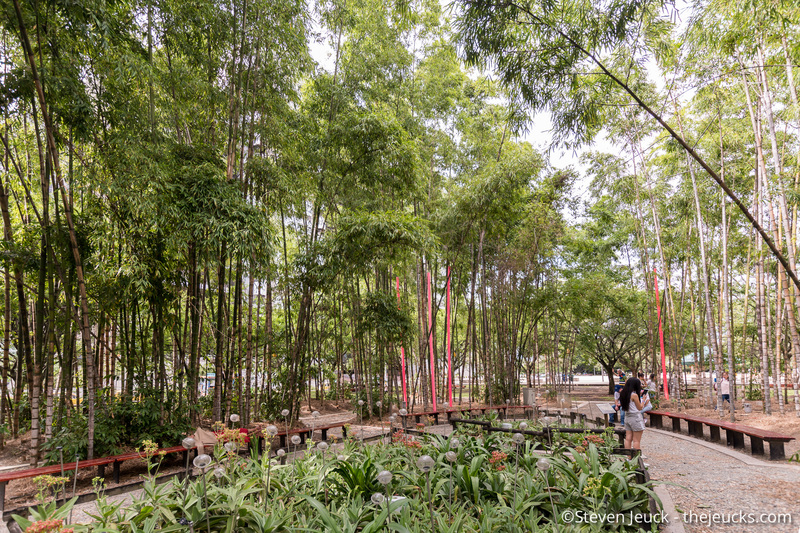 Water features, bamboo trees, and a huge sand area. Steve and I ate lunch here watching kids and adults have lots of fun. Plaza de la Libertad & Plaza Mayor – Both located near city center. Plaza Mayor is the convention center for Medellín. Plaza de la Libertad is home to several businesses and seen huge growth in recent years. Throughout the area, there is several statues and art features. We didn’t stay for long in these areas, mostly just passing through, but enjoyed seeing first hand their economic center. We are on our way to Cartagena, Colombia!!! We are excited for some beach time, pool time and sightseeing in the Old City.